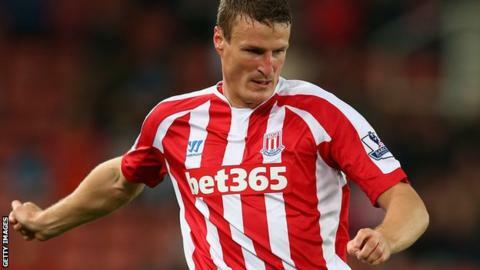 Leicester City have signed Stoke City defender Robert Huth on loan until the end of the season. The 30-year-old made 187 appearances for the Potters after joining the club for £5m from Middlesbrough in 2009. "I'm not expecting to walk into the team," he told Leicester City's YouTube channel. "I will need to prove my worth and hopefully I can do that." The German is currently serving a two-game Football Association ban for comments made on social media. He will miss the Foxes' Premier League match against Crystal Palace at the King Power Stadium on Saturday, but will be available for the trip to Emirates Stadium to face Arsenal on 10 February. Huth, who started his professional career at Chelsea in 2002, won the Premier League twice in his four years at Stamford Bridge. Meanwhile, Stoke have also allowed two of their younger players go out on loan. Under-21s right-back Elliot Wheeler has joined Conference strugglers Nuneaton Town on a three-month youth loan, while winger Adam Thomas has moved to Conference North play-off hopefuls Hednesford Town for a month.